Many of these things can also be blog posts. The key to maintaining a good email newsletter when you already have a blog is make the content the kind of thing that is personal, less polished, and a glimpse into you and your thoughts. Exclusive content that doesn’t make it to the blog is good too. Perhaps it’s too short for a blog post, or you don’t want the world at large reading it. Your newsletter is one of your greatest assets if you use it to develop great relationships with your fans. Check out this link for info on how to set up an artist newsletter. 1. Your Work – You should talk about your art, obviously. Write about it, share pictures, video, and make it intimate. More than what you share on your blog, make your newsletter a personal connection with your fans. Write it as if you are speaking to one specific fan, and you’ll notice that people are really connecting with what you do. 2. Your Play – what you do for fun, for entertainment, why art can feel like work after a while, etc. Art is what most people do for fun. People see artists as celebrities, even if they’ve only sold a few pieces of work. They are honestly interested in everything you do, so giving a little glimpse into your life just draws them in more. 3. Old work that hasn’t been seen in a while – Have a piece that you worked on years ago that has been languishing? Dust it off, put up a picture and talk about how your work has changed or evolved – or not. 4. New work you’re not selling – Have a piece that you’re not selling because it means too much, or you did it for charity, or as an experiment? Talk about that and what your motivation for that was. 5. Selling art – You can build a secondary following in the art world by occasionally talking about the business of art, and how you are (or are not) succeeding. These people are important because they can spread the word about you and what you are doing. 6. Creativity – So many people look at art and say that they wish they could do that. People are fascinated by the creative spark that artists have. Talk about what drives your creativity, your creative process, or your creative struggles. 7. Successes – Is your art career taking off? Talk about it! Success breeds success and people love to read success stories. Even if you’re not a big time artist, talking about small successes like getting into a major gallery or launching a Web site can be a big boost. 8. Failures – The only thing more interesting than success is failure. Talk about what happened, and then talk about what you learned from it. This is a great way to overcome your failures. If your recent sales efforts are falling short, talking about it with your intimate audience is a great way to work out what went wrong and how to fix it. 9. in the studio – Who is not interested in seeing what an artist’s studio is like, or reading a description of it? Talk about your studio, how you came to the space, how it affects your work, what you do there and what you cannot do there that is related to your work. 10. Setting up for a show – Are you slammed for time because you have a show coming up? Say that. People love hearing about your success, and they’ll be interested in knowing if they can come to your showing. 11. Your educational background – some artists are self taught, some went to big time art schools, most are somewhere in between. Let’s be honest though, most people’s college experiences were not as unique or interesting as art school or a performing conservatory. Share some stories from your education and how you use it now. 12. Your day job – Unless you are established, you probably have a day job. Is it interesting? Some artists have some of the most interesting day jobs I’ve ever seen. I have interviewed several of them. It’s always been an interesting read. 13. The reason you became an artist – Everyone has that story of loving art as a child. What made you go from being interested in art to pursuing it as a career? Was there a defining moment, a teacher, or a series of events? 14. famous artists who inspire you – While most people know about Picasso and Shakespeare, there are hundreds of artists who were seminal to different schools of art. Write about some of your favorites and how they inspire you. 15. Other artist’s work – Talk about other artists you are excited about. Highlight up and comers, talk about who you aspire to be, and why their work is important. Share your excitement and passion. 16. Your inspiration – How do you come up with a new creation? Do you go driving in your car? Sitting in meditation? Sitting on the toilet? People are always looking for new ways to be creative, and they often look to artists for that inspiration. 17. The things that bring you down – If you occasionally talk about your struggles, people love to see that vulnerability. Nothing rallies the troops like a little cry for help now and again. Don’t be negative, and don’t talk about these things too often, but fans love to feel like they are part of your life and your community. 18. Holidays – acknowledge holidays as they come and go. Share what you did, where you’re off to, and engage your fans. Find out what they like to do! 19. 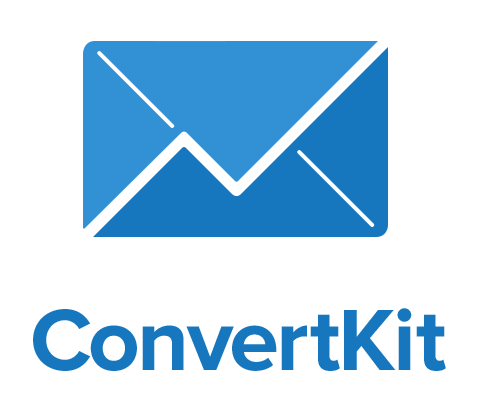 Calls to action/fan engagement – Give your newsletter fans something to do. Ask them to share content, have a contest, invite them to an exclusive showing of your work, or any number of things that they can easily do. 20. Upcoming shows – You should probably have a list of your next 2 – 3 upcoming shows in every issue of your newsletter. It’s important to make sure your fans know where you’ll be! 21. Your favorite charity – Are you an animal advocate? Do you support a children’s cause? Talk about your charity. 22. Your favorite green cause – It’s very popular for artists to be supportive of the environment right now. You might score some points with your readers by talking about your favorite green cause. 23. Now it’s your turn. 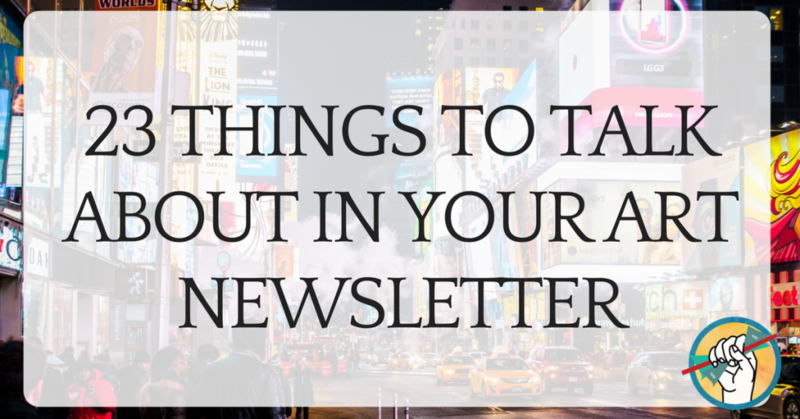 What do you talk about in your newsletters? Let’s help each other out! Let us know in the comments below. Recently I’ve been sharing news about our little one on the way. As my wife’s pregnancy has progressed, I’ve shared about our ultrasounds, painting the nursery and the baby showers. I’d come up with the idea to trade art for baby items, calling it my baby barter deal, http://tinyurl.com/VAbaby, which I also shared in my newsletter. Newsletters are great because they can serialize events as they continue to develop. Stories of upcoming shows and noteworthy commissions have been fun to share because it’s like installments each issue. My blog has been more about daily journaling kind of, mixed with encapsulated thoughts and events. Thanks for this post, great ideas. Absolutely, Daniel, and the baby barter deal is so fun! Thanks for sharing! I can’t wait to hear what others are doing with their newsletters. I think I just found a new daily read. Thank you. .-= Aric Hoek´s last blog ..B&W Engagement =-. Usually in my newsletters I have an intro, my Current Inspiration where I talk in depth about a new piece of work, my news & events, What You Missed at my Blog,and another article. For the other article, I try to make it something related to my art, but not about me. I’ve reviewed exhibitions, interviewed gallerists, talked about how to care for my pieces, had a jewelry-speak glossary, etc. .-= Wendy Edsall-Kerwin´s last blog ..Four Days of Cuffmas Past, Eight More to Go =-. Thanks for the Abundant Artist blog and all of your advice. I have been an artist with another job for a long time, but have decided to devote my career to my art this year! I wanted to write a newsletter because I had one in another retail endeavor and it worked so well for me. I am excited to have your advice on the newsletter for artists. Thanks Marsha. Good luck with your new business! Thank you for the fantastic advice. I’m just starting out in my artistic career, having only done it as a hobby before, so I’m still slowly building up a fan base. I’m finding I’m tough thinking of what to write in social media posts etc. as I just don’t feel that my life will be that interesting to other people (although other artists blog posts and newsletters fascinate me). These are some great ideas to help me get over the block. OMG! This is such a fantastic list of topics!!!!! There are lots of techniques for finding a boost in traffic to all your page Some is perfect for you together with most will not You could try the minds herein and improve them or http://epicbeaver.com/buy-instagram-followers/ fungus all of them to effort http://epicbeaver.com/buy-instagram-likes/ even much better By working hard trying new ideas and finding out what works best for you will be very effective in boosting your traffic, traffic does not come easily buy instagram followers. Thank you for these! I was clueless before reading this as to what collectors want to know! Now I have lots to talk about, if I can make the time. This post ROCKS. Cory, I’ve been listening to your podcasts, and reading your blog, and it’s made an incredible difference in my life! I went from “I want to get back to my art,” to making and posting one drawing per day (on Instagram for accountability), and making one painting per week. Those paintings will soon become my current body of work, but with your tips, I can start creating content for my website right now, using my drawings. This is just what I was looking for. With sincere appreciation for your generosity!! These are fantastic ideas. I’m not very good at newsletters and these are just perfect. I usually just stick with events or new works. They’d be great for expanded blog posts, too! Write a longer blog, but take a snippet of it to put in your newsletter! I have always wanted to start a blog but was always a bit apprehensive because I never had a clue on where to start. This article has now given me clear insight on how to get started without any apprehension. Thank you! Thankyou for this it has helped think of some ideas for my first newsletter. I have recently gone full time with my art business. wwwillustr8.me. I write about day to day processes that inspire my work . Especially nature of all sorts .